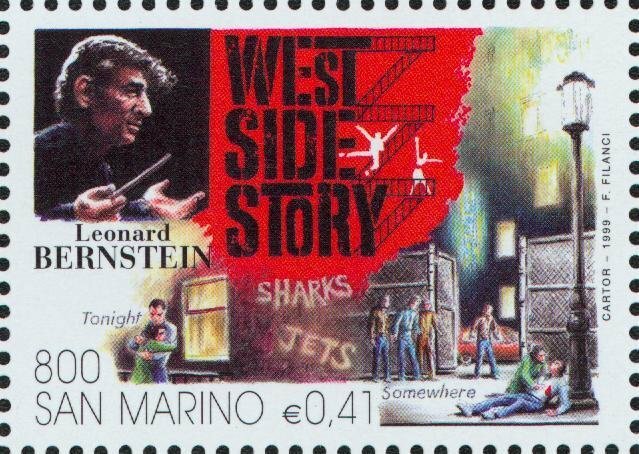 Without going back and checking, I'm not sure whether any Italian stamps have been included in the first twenty columns. So it's time to recitfy that. There are plenty to choose from, so I will cover them in stages. 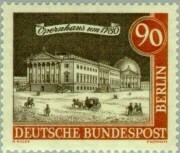 This first part covers the first three issues, a total of nineteen stamps. 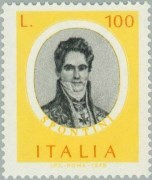 The first release, in 1935, commemorated the 100th anniversary of the death of Vincenzo Bellini in grand fashion with a set of eleven stamps, though it would seem that the designers opted for quantity over quality. 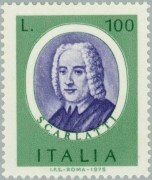 The next set to be issued, in 1937, featured Giovanni Pergolesi and Gaspare Spontini, each stamp including the word "centenario" (centenary in English) which is rather odd as neither composer was born or died in 1837. 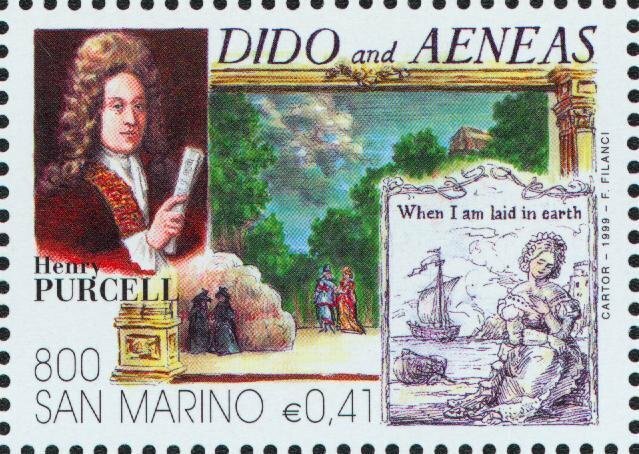 Pergolesi did die in 1736, so it is close to his bicentenary, whereas there seems to be no relevance at all in the term for Spontini (1774-1851). 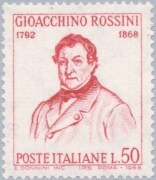 Numerical accuracy is restored for the 150th anniversary of the birth of Gioachino Rossini in 1942. The renowned Italian design style still remains absent, and I'm sure you've noted the absence of Verdi and Puccini. They will have to wait for another day. 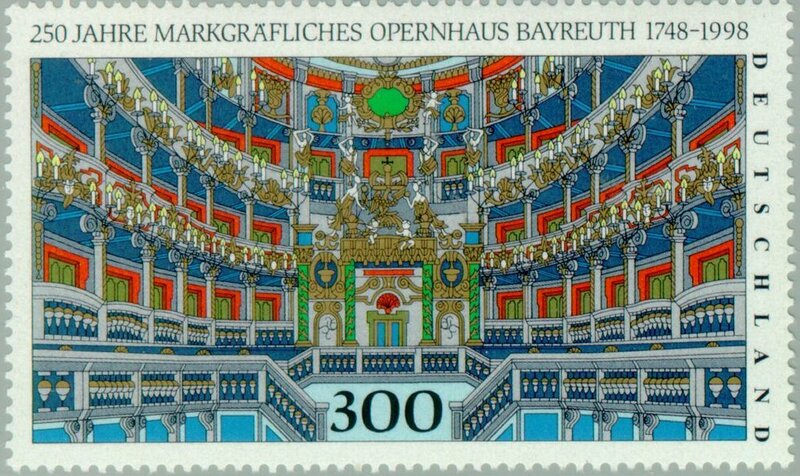 We will return to Italy presently, but this topic was prompted by finding a striking German stamp from 1998 depicting the Margravial opera house in Bayreuth, commemmorating its 250th anniversary. This isn't, as you will have gathered by the dates, the Wagner one. Youi can click on the image below for a larger version. 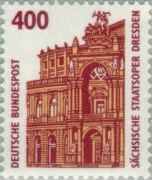 So I looked for others and found well in excess of 100, so decided to limit this column to German stamps, where there were nine more. 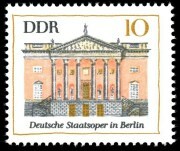 The Berlin opera houses fared best, with six releases from the three different issuing authorities: East Germany, West Germany and Berlin itself (in the period of the division of Germany, West Berlin issued its own stamps). 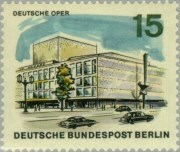 The 1965 Berlin stamp depicts the new Deutsche Operhaus in West Berlin, the other five the Staatsoper Berlin, which was in East Berlin. 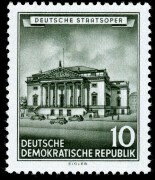 The Semperoper in Dresden (in the former East Germany) appears on two releases, one of which is from pre-unification West Germany, while the Frankfurt Alte Oper is a recent definitive. So we return to Italy and take up the story where we left off - the 1940s. All of this week's releases are anniversaries of births or deaths. 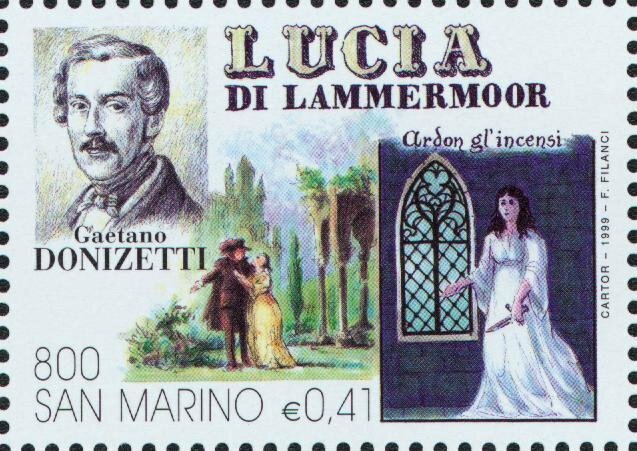 The centenary of the death of Gaetano Donizetti in 1948 and the bicentenary of the birth of Domenico Cimarosa in 1949 round off the decade. 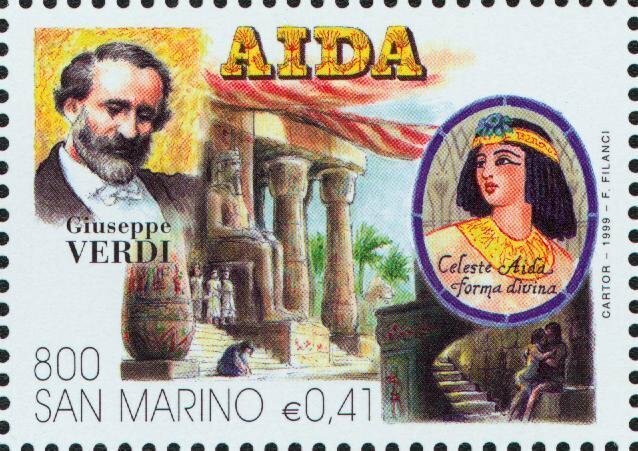 In 1951, we reach the biggest name in Italian music - Giuseppe Verdi - with a set marking the 50th anniversary of his death. 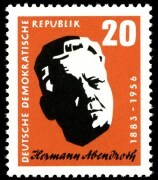 Appropriately, a new method of printing the stamps - in two colours you will note - was employed, giving rise to a much higher quality product. Unfortunately, the cost of this method of production was such that it was abandoned quickly. 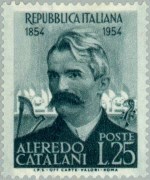 The rather more mundane monochrome design was restored the following year for the 150th anniversary of Vincenzo Bellini's birth, and in 1954 for the centenary of the birth of Alfredo Catalani. 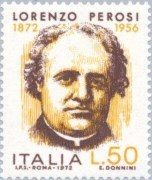 We jump forward almost a decade to 1963 for a pair of birth anniversaries - Verdi (150th) and Pietro Mascagni (100th). Here the designs step up a notch with two colours and the composer's image with a major Italian opera house: La Scala Milan for Verdi and Teatro Costanzi in Rome for Mascagni. 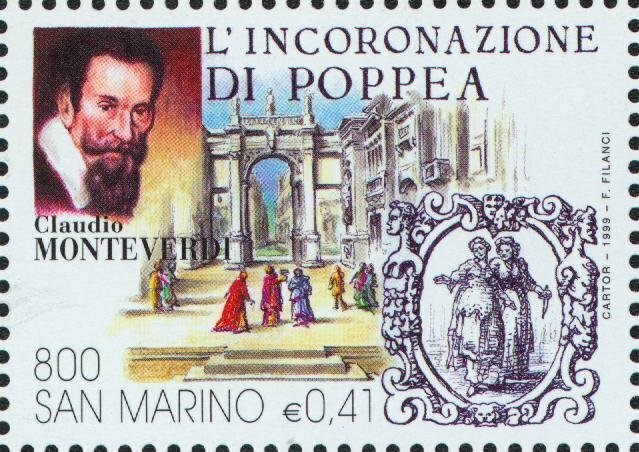 Four more anniversaries to round out the 1960s and this week's column: Claudio Monteverdi (400th - birth - 1967), Umberto Giordano (100th - birth - 1967), Arrigo Boito (50th - death - 1968) and Gioacchino Rossini (100th - death - 1968). The first three, especially the Boito, have designs that are quite modern for the time, so the very plain Rossini comes as rather a surprise. Those of you with a good memory for composer dates will possibly have picked up a surprising omission. 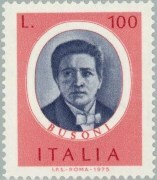 1958 was the 100th anniversary of the birth of Giacomo Puccini, but there was no stamp to mark it. 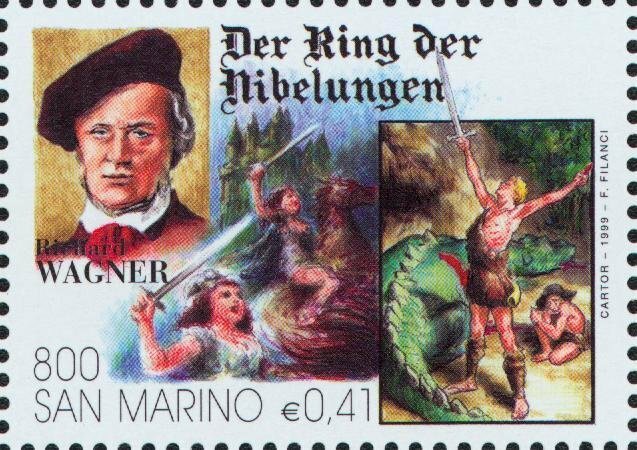 It would seem the authority responsible for commissioining stamp designs wasn't a fan. Another visit to Italy, and no, this will not be the last, as it only takes us up to 1986. 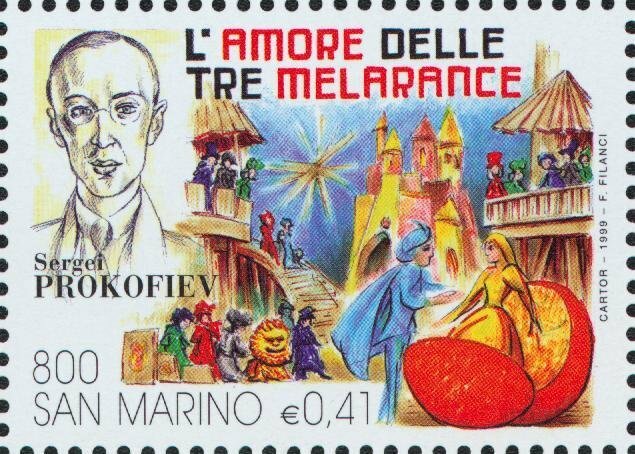 Towards the end of last week's column, I commented that the rather plain, old-fashioned designs of many Italian stamps, at least as represented by the composer subset, was still in evidence in 1968. As you will see, it continued into the next decade. 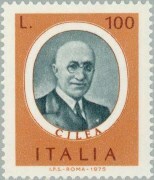 The centenary of the death of Saverio Mercadante in 1970 produced a stamp that would not have seemed particularly modern had it been released in the 1930s in other countries. 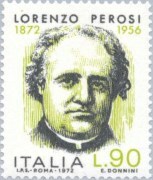 1972 saw two stamps of the same design released to mark the centenary of the birth of Lorenzo Perosi, best known for his sacred music, appropriate since his "day job" was as a priest. 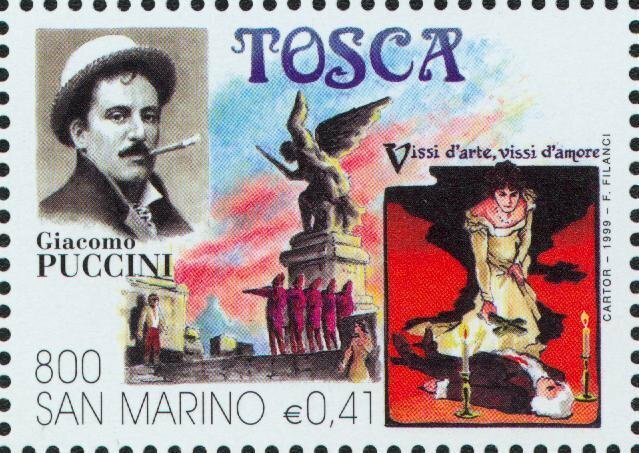 Finally we get to Puccini in 1974, the cenenary of his birth, and an Art Nouveau-inspired design for the first stamp issued to honour him. The following year, there was a release for the 450th anniversary of the birth of Giovanni Palestrina. 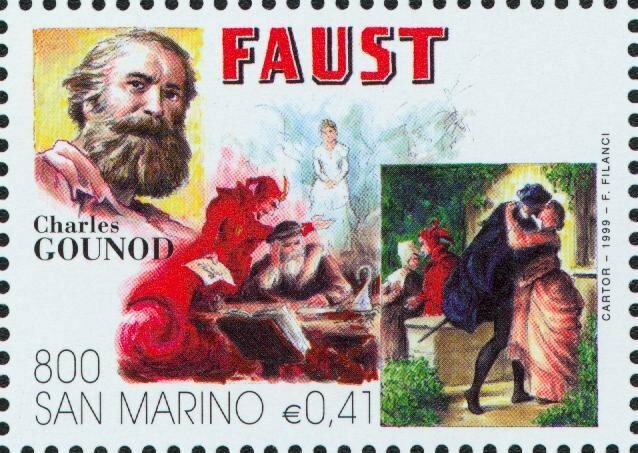 Also in 1975, the postal authorities released a set of seven, with a common rather austere design, featuring Franco Alfano, Ferruccio Busoni, Luigi Cherubini, Francesco Cilea, Alessandro Scarlatti, Gaspare Spontini and Antonio Vivaldi. 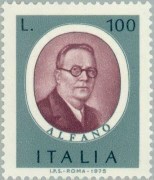 Only Alfano had a significant anniversary in 1975 (he was born in 1875). 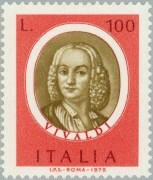 Given that Vivaldi's tricentenary was only three years later, it seems more logical that he could have been celebrated then. Over the next decade, there were six more releases: Ottorino Respighi (1979-birth centenary), Niccolò Paganini (1982-birth bicentenary), Girolamo Frescobaldi (1983-400th anniversary birth), Vincenzo Bellini (1985-150th death anniversary) & JS Bach (birth tricentenary), Amilcare Ponchiello (1986-death centenary) and Giovanni Pergolesi (1986-250th death anniversary). Certainly the design quality had become more modern by the 1980s, but I doubt that I am alone in finding the Pergolesi image rather unsettling. 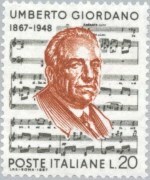 The final visit to Italian stamps takes us from 1990 to 2013, and includes some composers already featured, and some "new" ones. 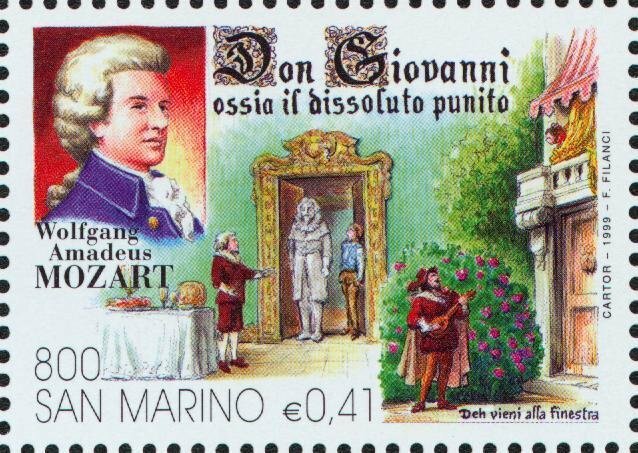 In the "new" camp are Giovanni Paisiello and Wolfgang Mozart, commemorating the 250th anniversary of the birth of each in 1990 and 1991, respectively. 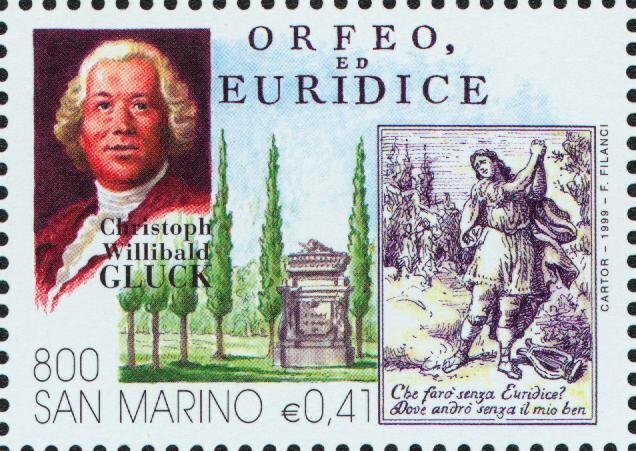 Many countries issued Mozart bicentennary stamps in 1991; what makes this Italian release more interesting is that this is the only stamp of all the ones we have seen in these four columns to feature only a non-Italian composer (if you look at last week's column, you will see there was a 1985 release with Bach but also Bellini). 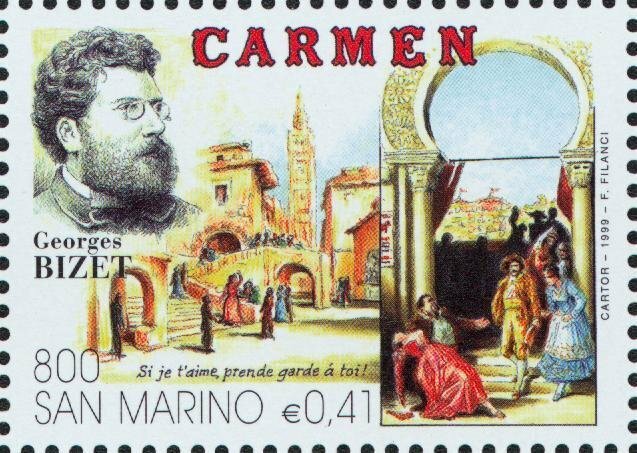 The other composers to make a first philatelic appearance are Niccolo Piccinni (2000 - 200th anniversary of death), Nino Rota (2001 - centenary of birth) and Antonio Salieri (2000 - 250th anniversary of birth). 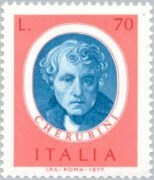 We pay return visits to Bellini, Cimarosa, Spontini and Donizetti, the first three with a common design from 2001. 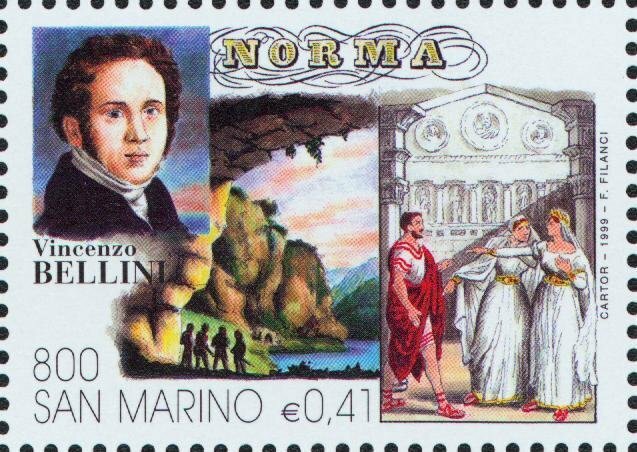 Spontini is the one who surprises me most - this, commemorating the 150th anniversary of his death, is the third time he has appeared on Italian stamps. Until I started looking at this topic, I'd never heard of him. Now that probably more reflects my lack of interest in 19th century Italian opera but the small presence his music has in the catalogue seems to be centred on one opera - La vestale - and the last review of it on MWI was back in 2005, and even that was a Maria Callas recording from 1954. 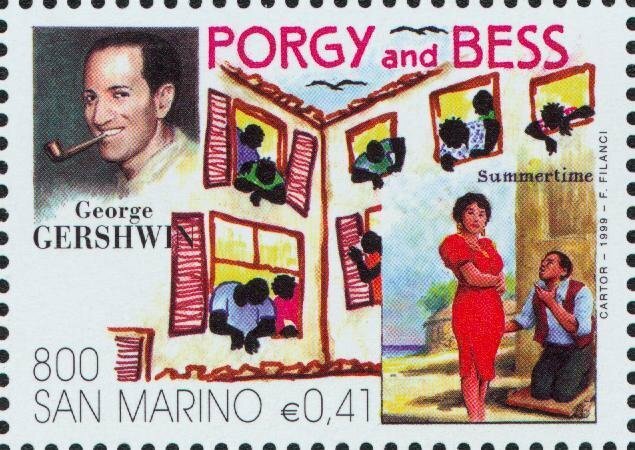 After not featuring for so long, Puccini gets two more releases, though the first in 2004 was marking the 50th anniversary of the festival in his name; the other one, from 2008, was for the 150th anniversary of his birth. We finish, as seems appropriate, with Verdi. 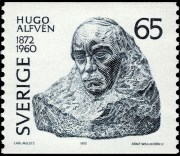 Also in that 2001 set shown above was a release commemorating the centenary of his death, and finally the bicentenary of his birth in 2013. This week finds us in Italy again, at least geographically, if not politically. I'm not aware of the tiny republic of San Marino being a hotbed of opera; indeed, I can't even confirm it has a professional opera theatre. 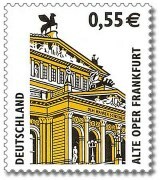 Nevertheless, in 1999, a set of 16 stamps was issued to celebrate the "400th anniversary of opera". It's not entirely clear what opera-related event from 1599 this refers to, as my researches suggest the first work we recognise as opera today was written some years earlier. 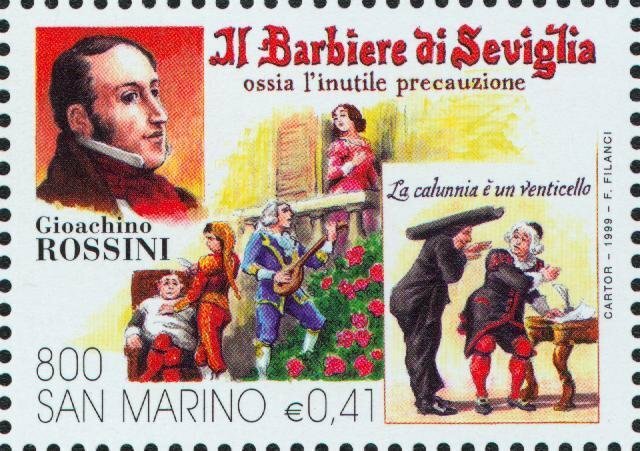 One source suggests it is 400 years of opera in San Marino, though nothing I've read suggests that this is the case. It seems to me that those responsible for selecting the composers and operas featured in the set have done a pretty good job. 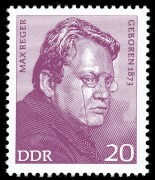 If you want to look at a larger view of any of the stamps, simply click on the image. 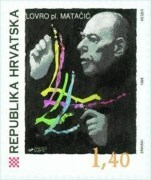 Having looked at orchestras on stamps in two earlier columns, let's focus this time on the conductors. I have not attempted to be exhaustive in this topic, rather choosing a dozen conductors whose names will be familiar to all readers. 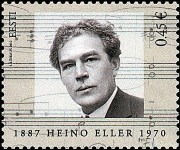 In doing so, I have opted for those whose reputation is principally as conductor; there were quite a few showing prominent composers in conducting guise, such as Richard Strauss, Vaughan Williams and Mahler. Perhaps the most notable absentee is Herbert von Karajan. Austria did issue a stamp bearing his image, but it was celebrating the 10th anniversary of the establishment of the Karajan Center. I have not included the set of four from the UK with Wood, Beecham, Barbiroli & Sargent as they were in the earlier column on British stamps. 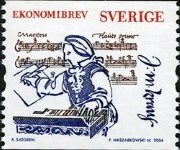 The Mitropoulos stamp also includes the image of Nikos Skalkottas. A change of content this week: not a composer or performer to be seen. 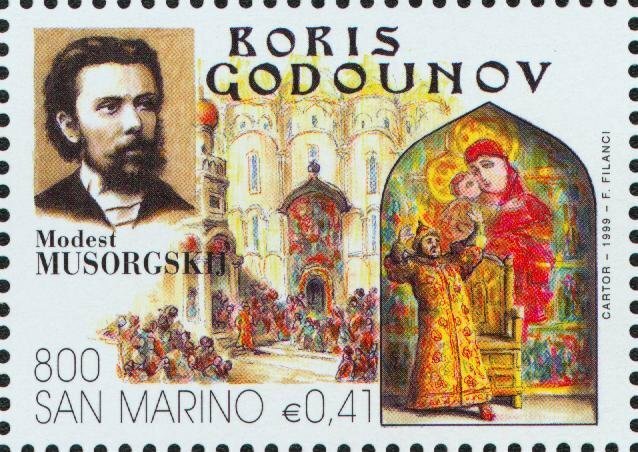 Instead we will focus on the "King of Instruments", the grand pipe organ, which has been well represented on stamps over the years. The thirty stamps below are certainly not a complete survey, but will do for our purposes, which is where a particular real organ itself is the focus, rather than a generic one in the design background. The first is from 1946, and shows an instrument from the West gallery of the Stephansdom in Vienna. 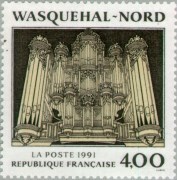 It was one of a set of ten charity stamps intended to raise funds for the rebuilding of the cathedral; the organ itself no longer existed, having been destroyed in 1945. The other two from Austria show the "Bruckner organ" in the Abbey of St Florian (1954), and the organ in the Musikverein, commemorating its 100th year (1970). 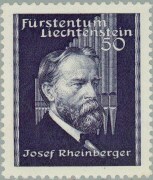 The first stamps of this theme that I had been aware of were from East Germany (1976), and celebrated the famous instrument builder, Gottfried Silbermann, with four of his output, located in Rötha, Freiberg, Fraureuth and Dresden. A Belgian set from 2000 shows not only the organs but also the churches in which they are located: Norbertine Abbey Church, Grimberg; Collégiale Sainte Waudru, Mons; O.L.V. Hemelvaartskerk, Ninove; Bastogne. The next group includes two each from France (Wasquehal and Poitiers), The Vatican and Poland (Jęd and Pelplin). Without doubt, the award for the most serious contribution to this topic goes to Luxembourg: a set from 2007 features no fewer than 12 instuments: Conservatoire, Bridel, Mondercange, Grund, Niederwiltz, Sandweler, Echternach, Esch-sur-Alzette, Philharmonie, Nommern & Heiderscheid. Here I'm using the term "unsung" to refer to those composers beyond the big names, rather than ones with very little presence in the catalogue. The forty-eight composers who will appear in this and the next two columns are likely to be mostly known to most readers, but certainly do not feature regularly in reviews on this site. That said, in just this month, there have been reviews of at least two of the composers appearing below. 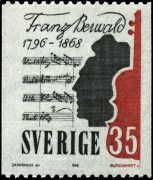 One further selection criterion is that the stamp was issued by the composer's home country, and not from some unlikely African country with no connection to the composer (see column #4 for example). Also, I have not included stamps which have already featured in previous columns, ruling out a number of candidates from Italy, Switzerland and the USA. 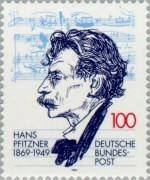 Sixteen more stamps featuring composers whose names will be mostly familiar, but not likely to be ones you hear or see performed very often.